Israeli research on chemical and biological weapons historically pushed Syria to reject the treaty banning chemical weapons. That is why the signing of this document by Damascus runs the risk of highlighting the existence and possibly the continuation of research on weapons designed to kill only Arabs. Dr. Basson Wounter at his second trial in 2011. He directed the secret research program into chemical and biological weapons led jointly by Israel and apartheid South Africa, from 1985 to 1994. Western media seem amazed at the turnaround of the United States with regards to Syria. Though they announced, two weeks ago, a bombing campaign and the inevitable fall of the “regime”, they are speechless before the retreat of Barack Obama. Yet it was probable, as I wrote in this column, that Washington’s commitment in Syria no longer has an important strategic objective. Its current policy is primarily guided by the desire to preserve its unique superpower status. Taking him at his word, which was originally meant by John Kerry as a joke, and proposing the accession of Syria to the Convention on the Prohibition of Chemical Weapons, Moscow has met Washington’s rhetoric without the latter having to fight another war in times of economic crisis. The United States maintains its status in theory, even if everyone can see that Russia now calls the shots. Chemical weapons have two purposes : either military or to exterminate a population. They were used during the trench warfare of the First World War to the Iraqi aggression against Iran, but they are useless in modern warfare, whose front is always moving. It is with relief that 189 States signed the Convention banning them in 1993: they could thus get rid of dangerous and unnecessary stockpiles, the possession of which had become onerous. A second purpose of chemical weapons is the extermination of civilians before the colonization of their territory. Thus in 1935-36, Fascist Italy conquered a large part of Eritrea by eliminating its population through the use of mustard gas. In this colonial perspective, from 1985 to 1994, Israel secretly financed the research of Dr. Wouter Basson ’s laboratory in Roodeplaat (South Africa). Its ally, the apartheid regime, sought to develop substances, both chemical and especially biological, that would kill individuals according to their “racial characteristics ” (sic), whether they be Palestinians in particular and Arabs in general, or people with black skin. The Truth and Reconciliation Commission was not able to determine the results of this program, nor what had become of it. At most it revealed the involvement in this huge secret project of the United States and of Switzerland. It has been established that several thousand people died as Dr. Basson’s guinea pigs. If one can understand why neither Syria nor Egypt signed the Convention in 1993, the opportunity offered by Moscow to Damascus to join today is a bargain: it not only puts an end to the crisis with the United States and France, but it also helps to get rid of unnecessary stockpiles become increasingly difficult to defend. For all practical purposes, President al -Assad has specified that Syria was acting at the request of Russia and not under pressure from the United States, an elegant way of stressing the responsibility of Moscow to protect the country in the future from a possible chemical attack by Israel. Indeed, the Jewish colony of Palestine has yet to ratify the Convention. This could quickly become a political hot potato for Tel Aviv. That is why John Kerry went there today, Sunday, to discuss the issue with Benjamin Netanyahu. If the Prime Minister of the last colonial state is clever, he should jump at the opportunity to announce that his country would reconsider the matter. 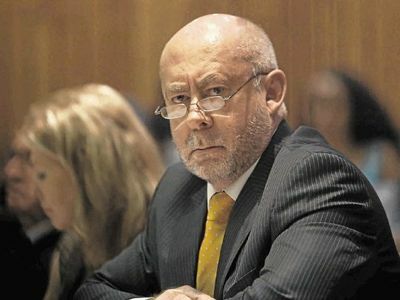 Unless, of course, Wouter Basson found ethnically selective gas and Israeli hawks are still considering using it.